Yeah!!!! finally have the living room put together to show you. It is still a work in progress with me changing things up in here but you can see how the living room is coming along. I stayed with my neutral love. Dove grey, whites and a little cream. The wallpaper added a little yellow into the cottage style living room. I am so happy I had a wall big enough in this tiny home for the old farmhouse window I had in the old house. This is my favorite chippy piece. Peggy was assisting with this picture!! I took some old end tables my daughter had in her basement and painted them white and added old chippy door knobs to this door. You know how I love to recycle old things into new things! My chippy old arch window fit in this space perfectly. My bargain armoire I just re loved fits nicely in the living room space. 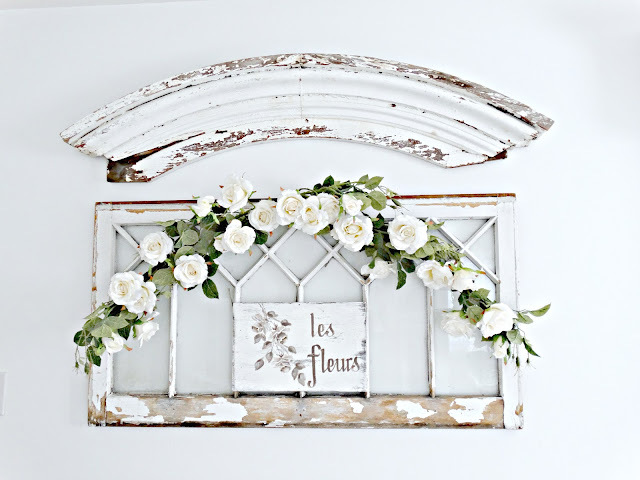 My old french window found a place. My great grandmothers old cedar chest is now my coffee table in the new house. Back in the day when you got engaged to be married you would get a Lane cedar chest. Then you would use these cedar lined chests to add gifts, new linens etc. to bring into your marriage. This usually was the first piece of furniture you brought into your home after you were married too. Have a great Friday and wonderful weekend. What a great job! It looks so peaceful. I have a question Kris. How does your husband like your style of decorating? Any complaints? Have a great weekend. No complaints. He is a trooper with my white femine decor. He does have the whole downstairs and his fireman cave so that gives him he style and space too. So it is a win win. I have this upstairs in my style and he has the downstairs in his style. Happy Friday. It looks so pretty. 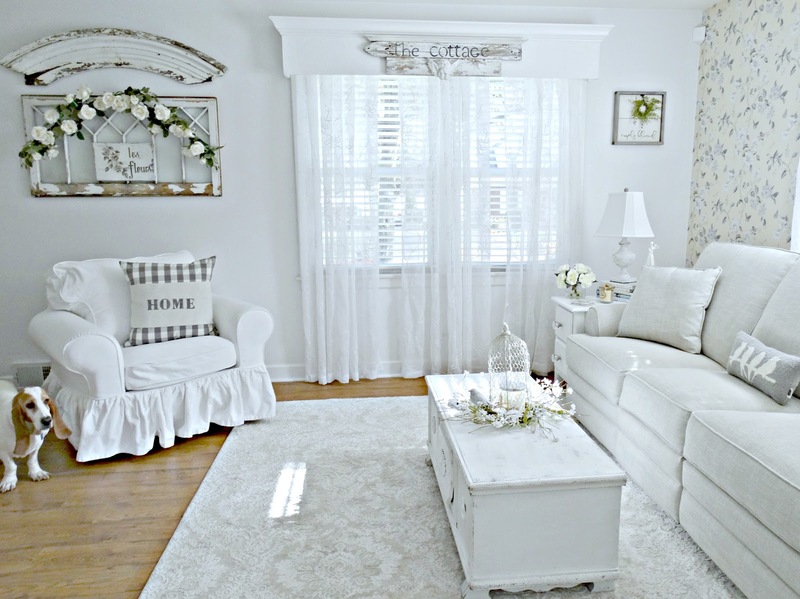 I love how you always make each room so pretty and inviting. Hi Kris, you made the living room look so nice and I love all of the furniture you redid. You and the hubs do such a good job in your homes. I hope you love living there. Enjoy the day and weekend. So beautiful....I love the wallpaper!!! You have so many exciting architectural pieces, Kris! They add so much character to your rooms. I just love how cozy the wallpaper makes everything too. It all came together beautifully! Your homes are always so beautiful!!! Love all your white decor Kris!! It looks so cosy. Have a nice weekend. How wonderful to have your great grandmother's chest...such a treasure! It's fun to see how you have re-loved pieces in this beautiful space...you did a wonderful job bringing it all together! Kris is it absolutely BEAUTIFUL!!!!! OMG I love the wallpaper so very much! I'm pinning it on my Stunning Wallpaper board! I LOVE Junk Cottage III !!! Looking forward to seeing more, especially the galley kitchen as I have one too! Looks fantastic! So nice seeing your things again in your new to you home. Kris, It looks fantastic. You got a lot of oomph going on in that room. What it lacks in size you make up for in charm. You pulled it all together beautifully. Have the neighbors been peeking in your windows yet? I love that you put the wallpaper up on the one wall-it is just enough to be interesting without overpowering the space! 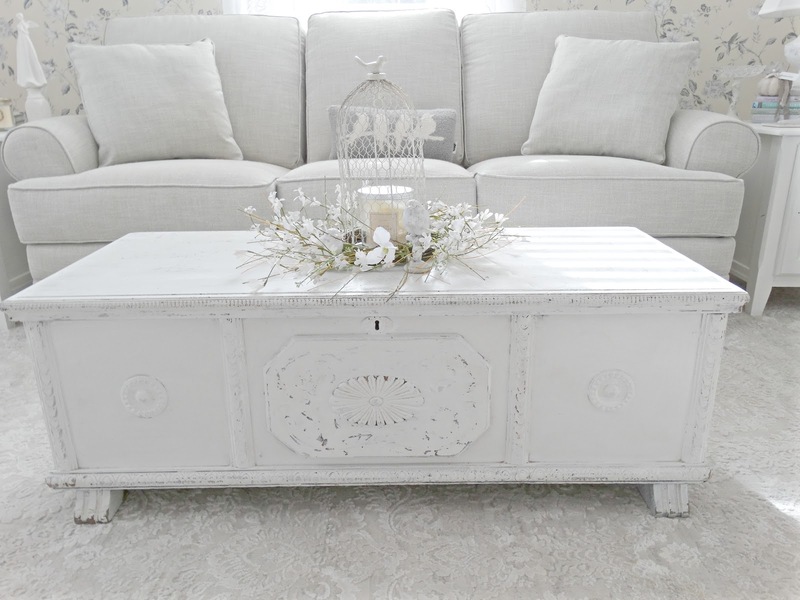 Your great grandmother's chest is a wonderful treasure and it fits perfectly in your living room, Kris. The room looks beautiful! 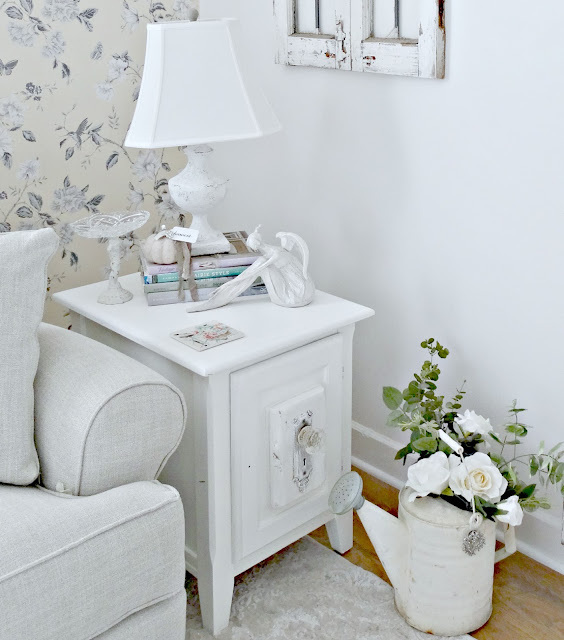 What a cool idea to add an old door knob to the side table. I love it. I am thrilled. I've been waiting, as I'm sure the rest of your readers have been! KRIS, it all looks amazing. You tied everything together so well, and I just wish you and Terry and Peggy the happiest of days, years together, in this darling house. I LOVE YOUR FRONT DOOR!!!!!!!! I love it, it is perfect! Your chippy windows are wonderful. You have placed everything so beautifully. You go girl!! I am so happy for you, Kris. You truly have made a cottage of your home. THis room looks terrific, and I am loving the accent wall with the hint of color. Very pretty. Peggy was looking at you like, "What are doing? Are you standing on the couch taking a picture? Does this mean I can stand on the couch too?" lol Have a great weekend. No lollygagging in the basement - just work, hahaha! It is so pretty, with so many wonderful pieces to look at. You've done a wonderful job with cottage #3. 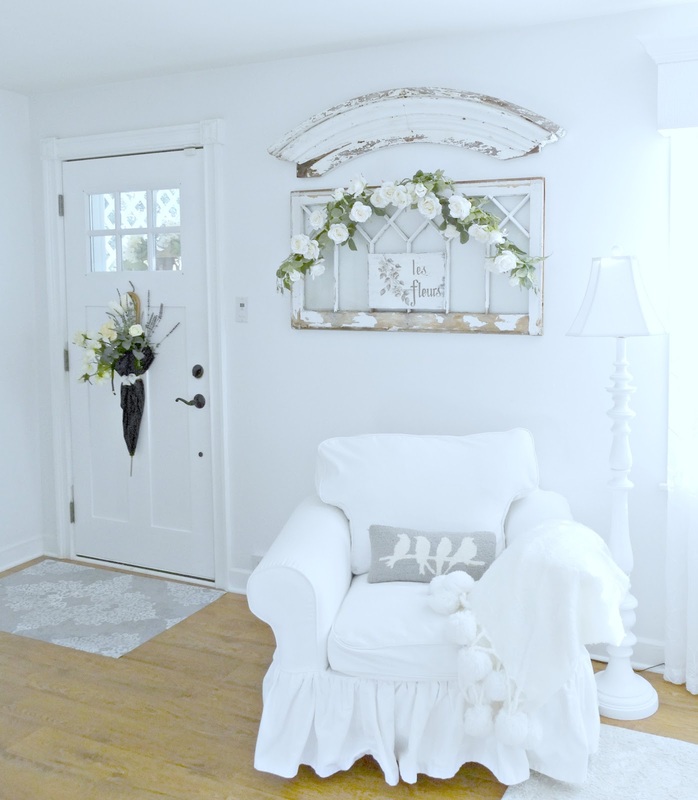 Your living room looks oh so cozy filled with your chippy white treasures, Kris! I love your cottage style wallpaper and I'm so glad that your most cherished pieces found a place in your charming new home. You've found the perfect armoire to fit the space and Peggy seems to approve of it all. I'm looking forward to seeing more of your lovely cottage. Have a wonderful weekend! Sheer perfection! And Oeggy has a look on her face that is priceless! She better get used to you taking her picture lol. Kris everything is so lovely. The wall paper adds so much to the beauty of the living room. I bet you just love to walk in and see just how beautiful it looks and know that you are here for good! It is lovely Kris! I am glad you were able to use your amazing pieces! I am so glad you found spots for your favorites. And, I'm so happy for Terry to be back and work and the two of you resettled in a home. Kris- it's so perfectly YOU! It's cheerful and bright and whimsical and awesome. I am so happy you were to able to re-use so many treasured items, too. That's always such a plus! Oh Kris, I knew it would be beautiful and it IS! I'm so glad you were able to incorporate so many special pieces. A job well done! And how cute is Miss Peggy helping out! Love the wallpaper.....details on your source? If you are asking about the wallpaper I got it in a wallpaper wholesale shop near my home. There was no information on it. They have what they have in the bins and when it is sold it is gone. So I am not sure how old or what brand this even is. So sorry. I just liked it when I saw it and thought it would be perfect for this wall. Sorry I cannot be of any more help. 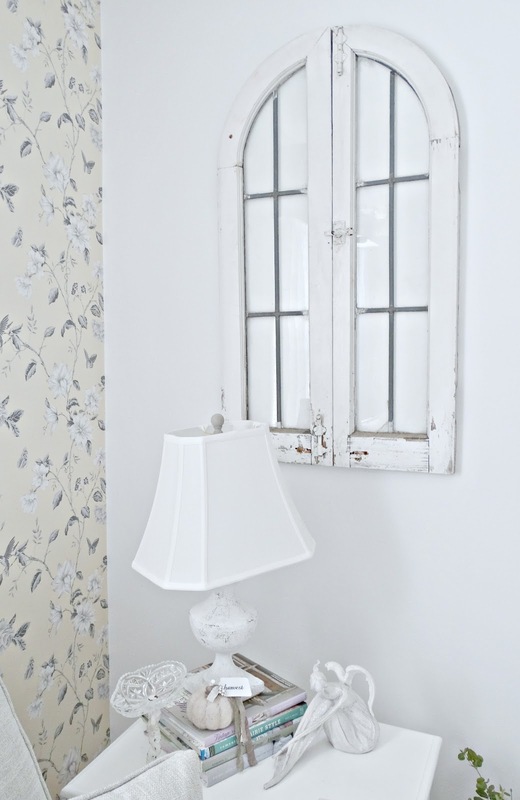 Looks amazing, Kris and the pretty wallpaper is the perfect backdrop for your chippy pieces. So nice to see you are FINALLY getting settled in Cottage III. Perfectly serene and enchanting. You're the zen master of decorating! Very sweet and cottagey !!! I think I smell another magazine feature! This is absolutely gorgeous. How you keep coming up with fresh and unique ideas in each house is beyond me. You have a gift my friend. The whole room is beautiful Kris. Happy to see your favorite treasures are in the room. The room may be smaller but all the charm overshadows that. What a sweet and charming cottage you have. The living room looks wonderful. Love the wallpaper, it's so pretty and looks good. You have done a wonderful job on your new home. Miss Peggy, likes it also. I know you are loving your new home and I look forward to seeing all the rooms. Hi Kris! 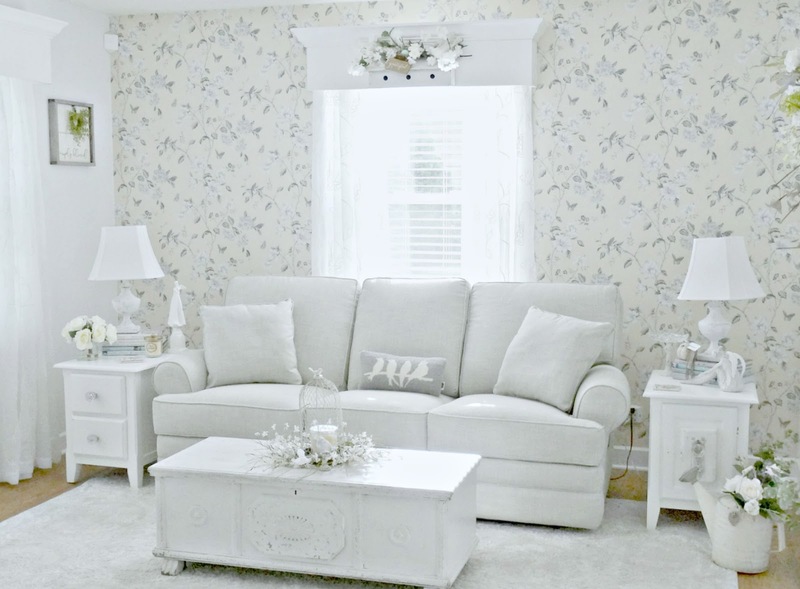 Your new living room looks lovely! I'm so happy that your favorite pieces have fit in beautifully! Look at cute little Peggy the photo bomber! She looks right at home. 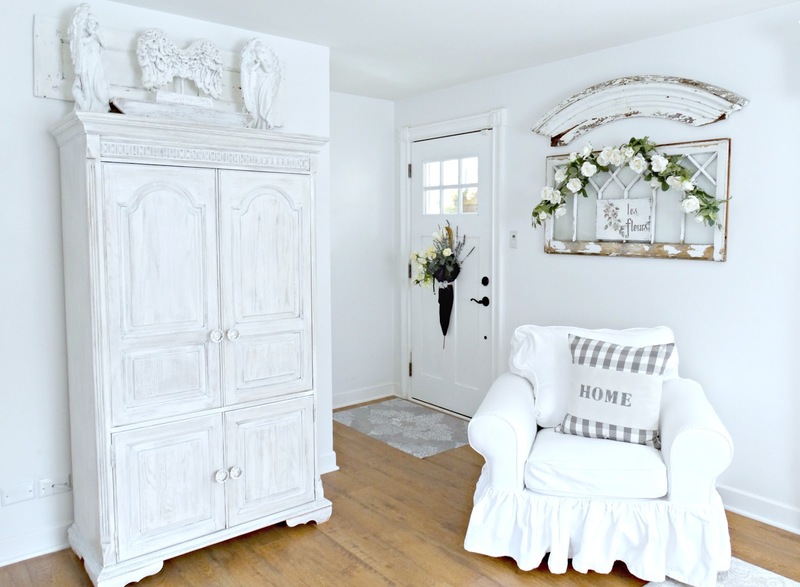 I really like how your chair and armoire create a little foyer by the front door! Everything is just perfect! So happy for you! Hugs! Looks wonderful with all your architectural pieces. Love your Great Grandmother's cedar chest and that you still have it. The cushion with the birds is sweet. Your floors are a nice contrast to the neutral colors. Coffee in the morning is a pleasant experience in this sweet room. This is beautiful Kris, it's looks just like "you"! the wallpaper is perfect! Amazing! I do love the look of the wallpaper. Do you have your TV inside the armoire? It looks fabulous. I love the cedar chest, all your wonderful windows and the re-loved armoire. HEAVENLY! Truly Kris, Your living room is amazing! 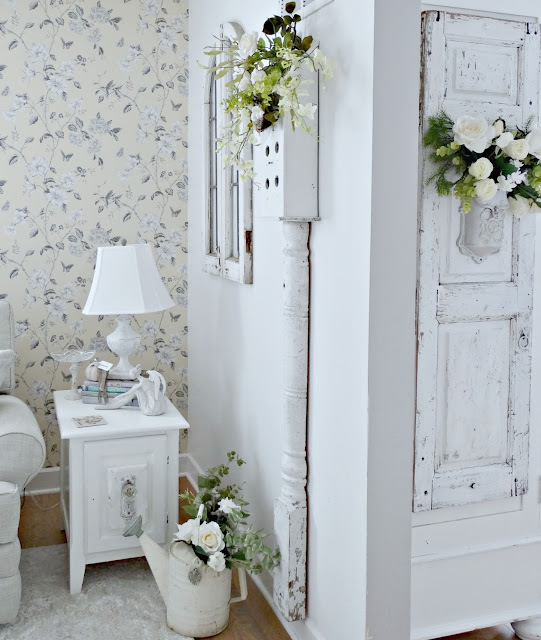 Love the wallpaper and all the white-washed accents! Perfect! Carla steered me to this post because I was wondering about wallpaper. I love everything about this post. You've given me so many great ideas. Thank you!! You've done a spectacular job in your living room. 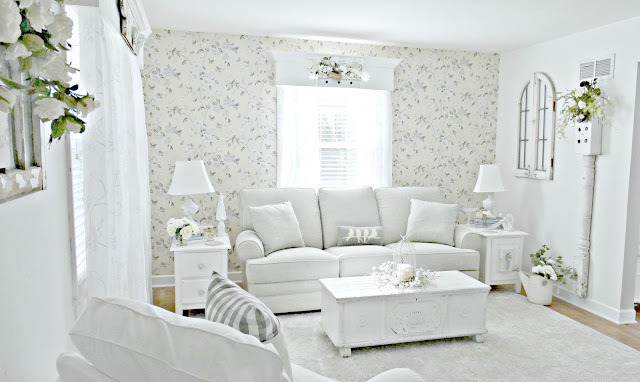 It looks very serene and the wallpapered wall adds just the perfect touch of whimsy. Kris, everything is wonderful and I love the use of the choppy knob. 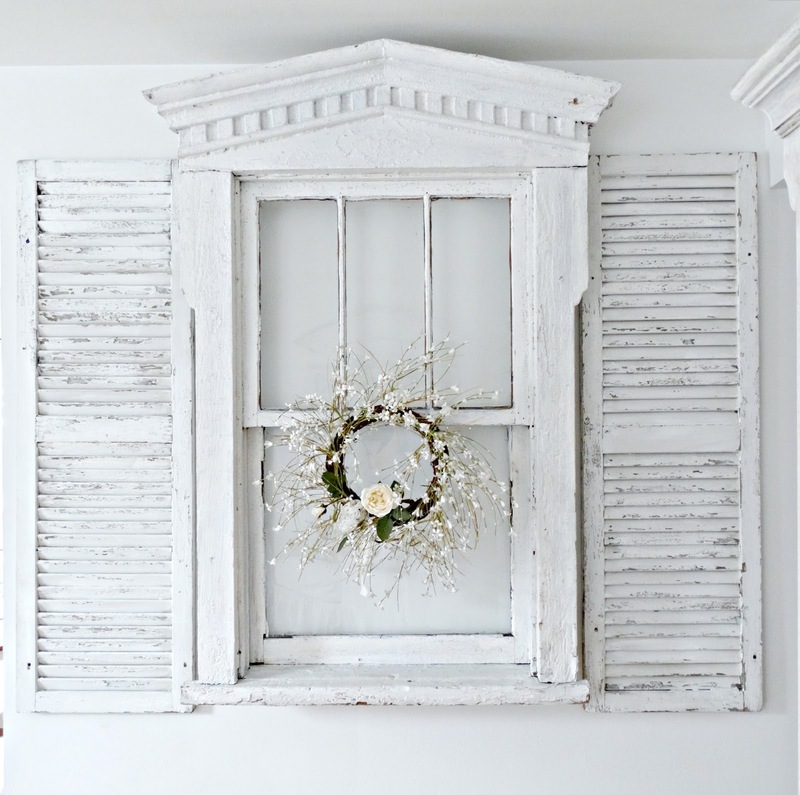 All your windows look pretty and the cornice over the window is so pretty. Gorgeous, Kris!! I absolutely love the wallpaper and your new sofa, the whole thing just came together so beautifully, as I knew it would! Hey, it looks great! On matters of style, swim with the current, on matters of principle, stand like a rock. Most people will never be great in #Style, BUT YOU ARE ;-). Let me share something with you! Did you know that you can print favorite photos of your work and hang them on the wall as canvas prints? Bring your ideas into real life, with an option to print even large canvas prints.